HEXUS reviewed the EVGA SC17 1070 Gaming Laptop shortly after launch, in November last year. That model was itself was a refresh of EVGA's first ever laptop, the SC17, which was released packing GeForce GTX 980M graphics, and reviewed by HEXUS in April 2016. Now EVGA has updated the SC17 yet again, however this time it brings a less dramatic change. 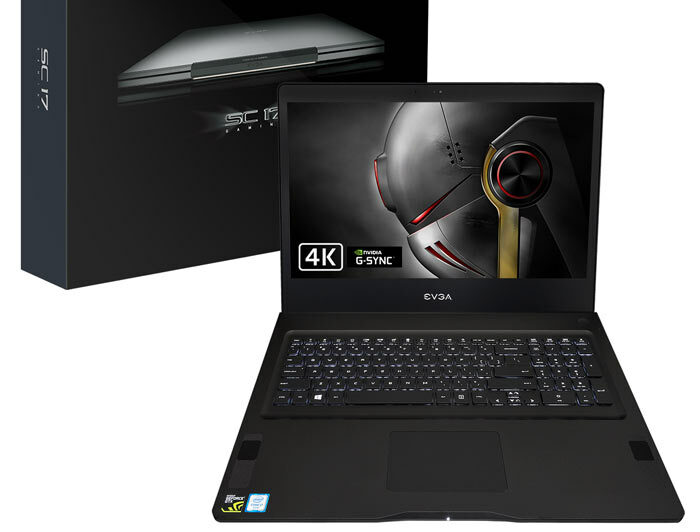 The EVGA SC17 1070 Gaming laptop now includes an option with embedded Nvidia G-Sync technology. If you go to the linked page and scroll down you will see the two options listed; the EVGA SC17 1070 G-Sync Gaming Laptop, and the older EVGA SC17 1070 Gaming Laptop. As is suggested by the name, the difference is purely in the display panel and the inclusion of G-Sync technology. Rather than trample through the full specs I've put together an SC17 1070 specs table image with the difference highlighted in yellow for you. See below. In our review conclusion, back in November, we noted plenty of positives and a few negatives about the new EVGA SC17 1070 Gaming Laptop. The inclusion of a GTX 1070 was a very worthwhile update over the previous model's graphics, but as well as the massive price tag, hefty weight and poor battery life we noted that G-Sync would have helped the review score along a bit. With the new AUO 4K G-Sync panel installed that is one tweak crossed off our wish list. Surprisingly, nothing else has changed at all according to EVGA's specs, even the weight of 8lb and 10.98oz remains exactly the same. EVGA is still selling the older non-G-Sync version of the SC17 1070 Gaming Laptop at the current time. I noticed that both have an MSRP of $2799 but going through to buy for an 'instant discount' shifts the price of the original SC17 1070 Gaming Laptop down to $2399, while the new G-Sync model is discounted to $2549 once added to a shopping cart. In all aspects, not for me. It's a bit pointless in something that advertises itself as a 4K gaming laptop, with that CPU/GPU combination. I have a GTX1070 with i7 7700k, and while it can manage 60fps 4K in Watch Dogs 2 with a mixture of High/Med settings, it's really for 1440p and 1080p with this standard of game. I expect the HK CPU means lower performance than that. Still, for other tasks I love 4K on a laptop. Mine is smaller than this, with a 15.6" panel, but I can finally have several windows open at once in my professional creative software without any need to resort to a second display. At arm's length, I'm able to set the scaling really low and still be able to see everything comfortably (and conversely, nobody else can really neb in over my shoulder unless they're literally breathing down my neck! ).